David Skora grew up in south western Michigan. His childhood was influenced by the beauty of Lake Michigan and the ever shifting aspects of it's shoreline. After graduating from Western Michigan State University with a Bachelors of Science degree in Graphic Design, he moved to Chicago and worked as a graphic designer. 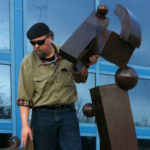 In the mid 1980's he accepted a position as a graphic designer on the east coast and moved to Connecticut. By the late 1980's he moved to New York City and attended graduate school at the School of Visual Arts. He received a Masters of Fine Arts degree in 1989. Currently, David lives with his family in the Northwest Hills of Connecticut where he paints, sculpts, and designs. When not working in his studio, he is a full-time Associate Professor of Graphic Design at Western Connecticut State University. His artwork has been shown extensively and can be found in many public and private collections throughout the United States.